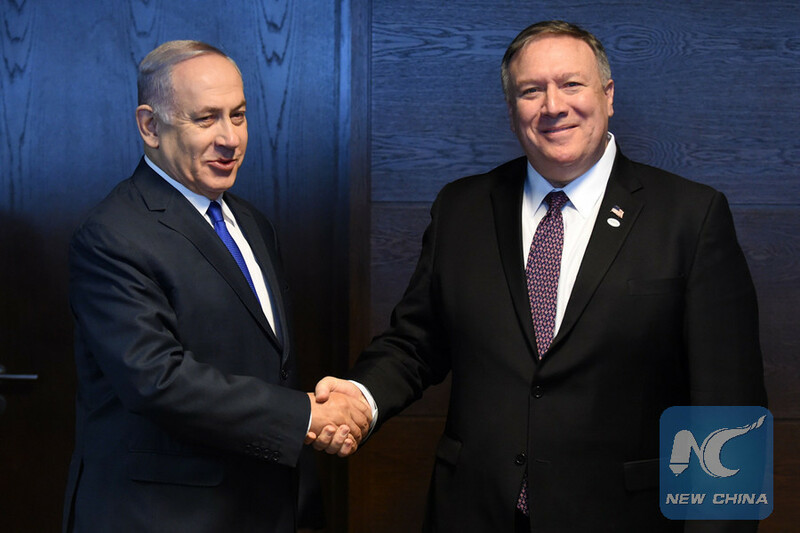 JERUSALEM, Feb. 14 (Xinhua) -- Israeli Prime Minister Benjamin Netanyahu and U.S. Secretary of State Mike Pompeo met on the sidelines of the Warsaw conference on the Middle East on Thursday. The conference, including foreign ministers from Middle Eastern countries, is "a historical turning point," said the Israeli leader at the start of the meeting, according to a statement issued by his office. "Israeli prime minister and the foreign ministers of leading Arab countries stood together and spoke with unusual force, clarity and unity against the common threat of the Iranian regime," the statement said. He hailed the conference as an "important understanding" that Iran is a mutual threat for the future of the Middle East and at the same time opens possibilities of new cooperation. Pompeo also slammed Iran. "Confronting Iran" is an essential requirement for achieving peace in the Middle East, he said. Dozens of countries, including some 11 Middle East countries, have attended the two-day conference, which will conclude on Thursday. The U.S. administration is co-hosting the conference and has invited Arab states and Israel to the conference. Iran was not invited. Lebanon and Iran have condemned the meeting as an "anti-Iran circus." The conference is thought to be an attempt by the United States to build an anti-Iran coalition of hardliners. Last year, U.S. President Donald Trump announced the U.S. withdrawal from the 2015 multilateral nuclear deal negotiated with Iran, and re-imposed sanctions on Tehran. Netanyahu considers Iran as Israel's greatest enemy. He is a long-time vocal opponent of the nuclear deal. Israel has carried out hundreds of deadly airstrikes in Syria, charging the attacks target Iranian sites in order to prevent Iranian forces from achieving a permanent military foothold in the country.